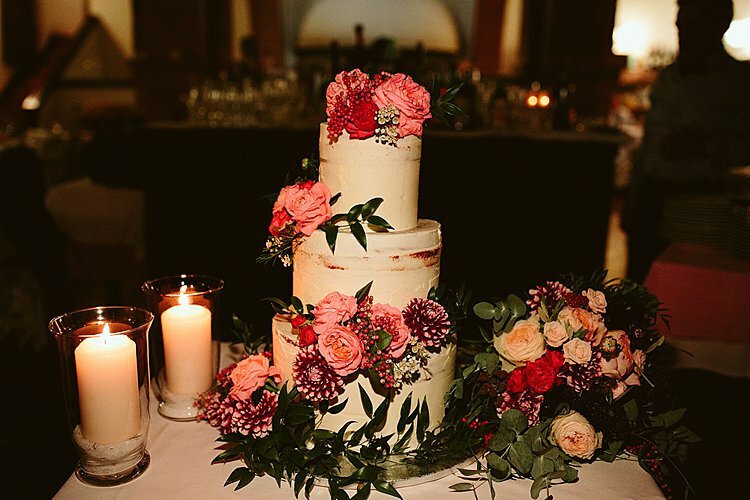 It’s always a special day here in STG land when one of our wonderful blogging brides’ weddings shows up in our inbox. 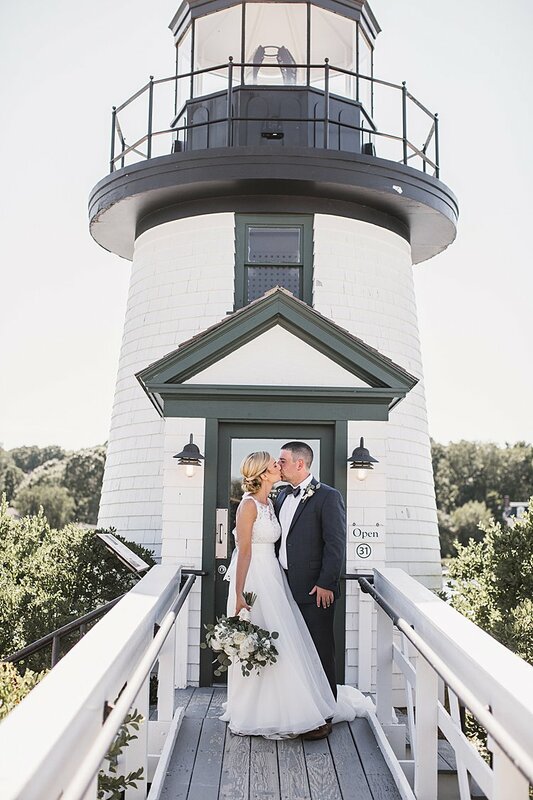 Especially when it’s as gorgeous as Alyssa and Colin’s luminous light house-themed Jew-ish wedding. 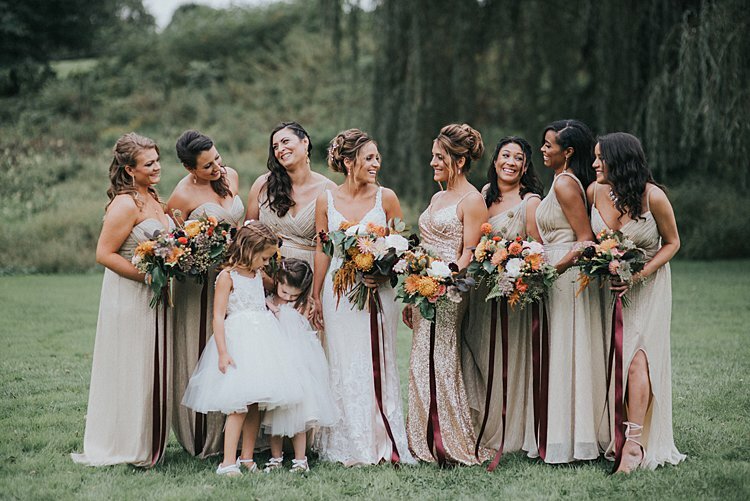 Seriously, just LOOK at Taylor Dunn Photography’s bright, airy, emotion-filled snaps of the big day. It doesn’t get much more picturesque than this. 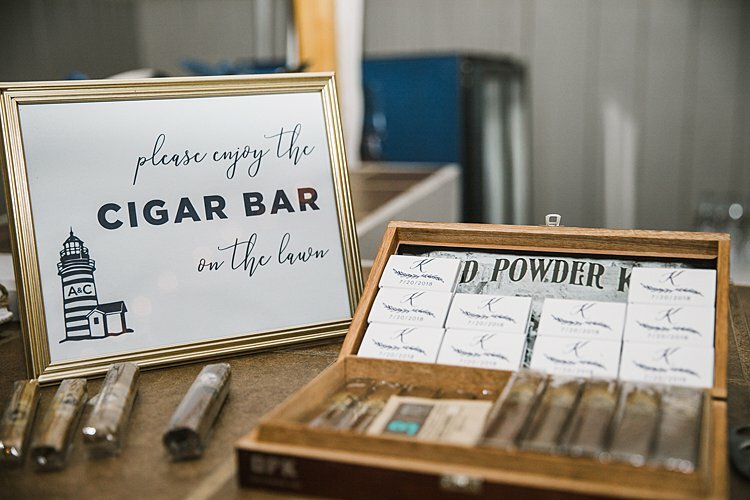 Everything from the couple’s sweet, whimsical ketubah from Smashing The Glass Recommended Vendor Ink with Intent to Alyssa and Colin’s adorable lighthouse logo to the fact that they used our very own Smashing The Glass pouch for their smash glass under the chuppah is total wedding goals. 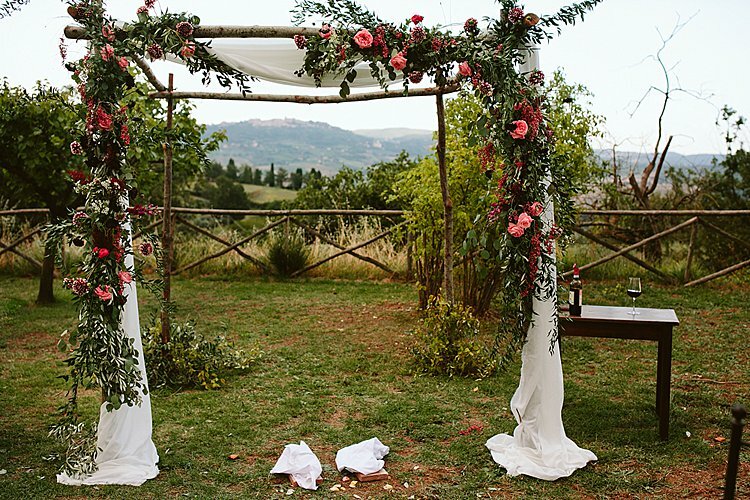 And speaking of that chuppah? First of all, it’s a charmer, with birch poles, a clean green and white color scheme, and just a touch of asymmetrical greenery and florals. 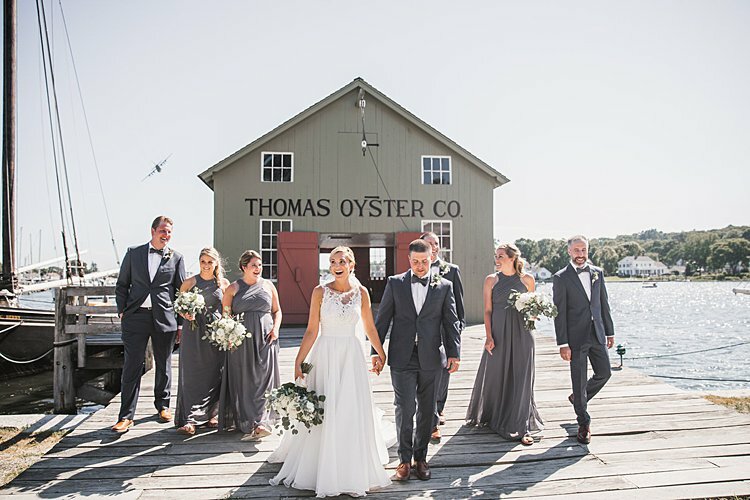 But it gets even better when you find out Alyssa and Colin’s fathers – plus Alyssa’s brother – teamed up to build it – using branches taken from trees in the yards of the bride and groom’s childhood homes (!!!). I KNOW. Alyssa, the bride: I met Colin at just 13 years old. He was a silly kid in the back of the school bus and to be honest one of the only Jewish people I knew. We spent countless rides to school laughing and teasing each other relentlessly. Senior year of high school we reconnected and rekindled our friendship. I was drawn to his humor, easy-going demeanor, kind nature, and his ability to be friends with everyone! Our friendship effortlessly evolved into an amazing relationship that I never expected. Attention all interfaith couples! 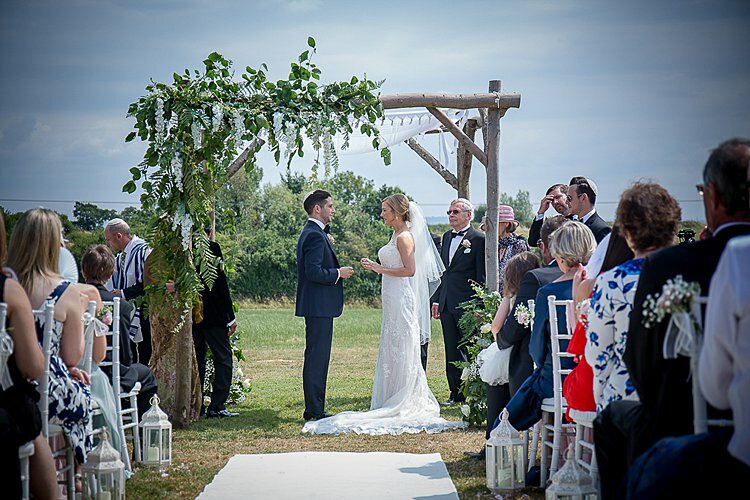 We know it’s not easy finding resources on how to craft a big day combining two different religions and backgrounds, and we’re always on the lookout for wise words from couples who’ve been there. Today, we totally hit the jackpot. 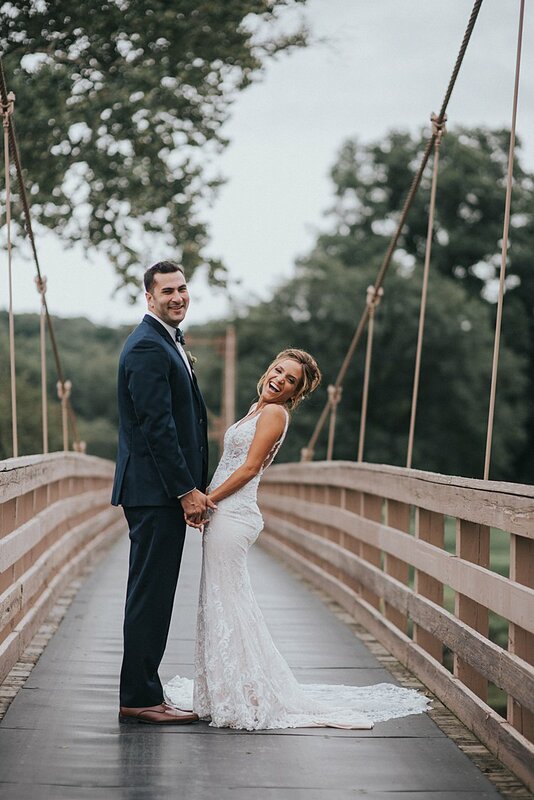 Crystal and Evan had a joint Jewish-Catholic ceremony, with a priest and a rabbi, and we love how involved they were in creating a personal ceremony that embraced both of their backgrounds. 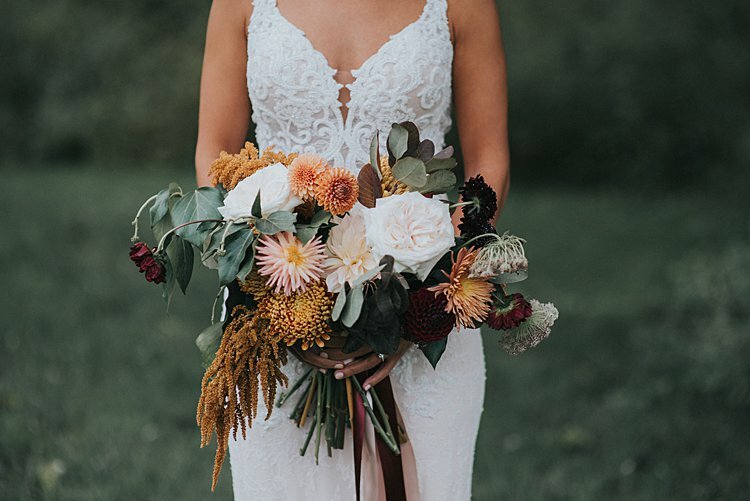 This also happens to be a totally gorgeous wedding — Crystal and Evan took full advantage of their late September wedding date with seasonal blooms and a color scheme heavy on moody autumnal hues. Jessie Casey’s photos and Fantasy Flash’s video captured all the gorgeous details. 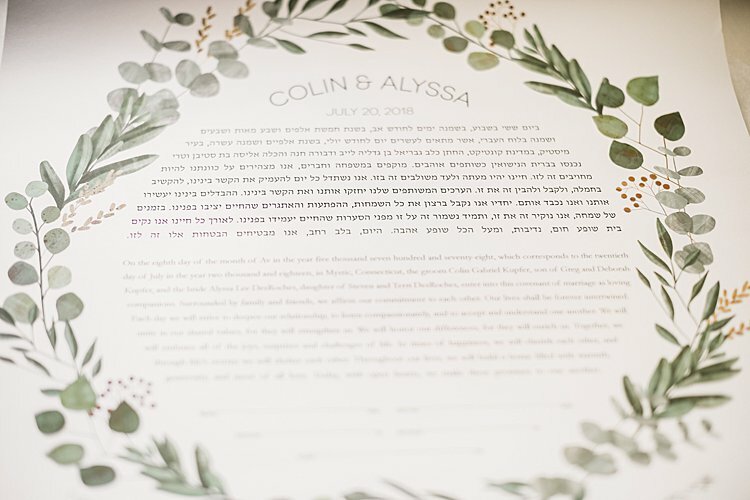 We’re crazy about their wild floral ketubah, which took full advantage of the venue’s permanent gazebo to craft a totally unique look. 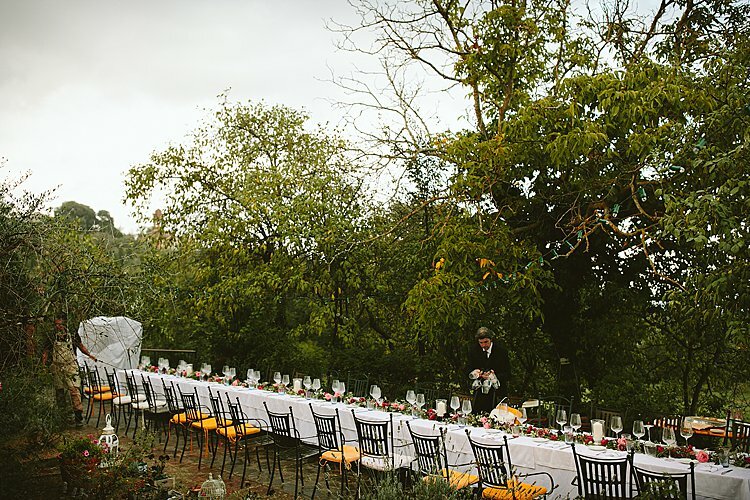 And how cool is the outdoor ballroom tent they held their reception in?! Crystal, the bride: Evan and I got married at West Hills Country Club in Middletown, NY. 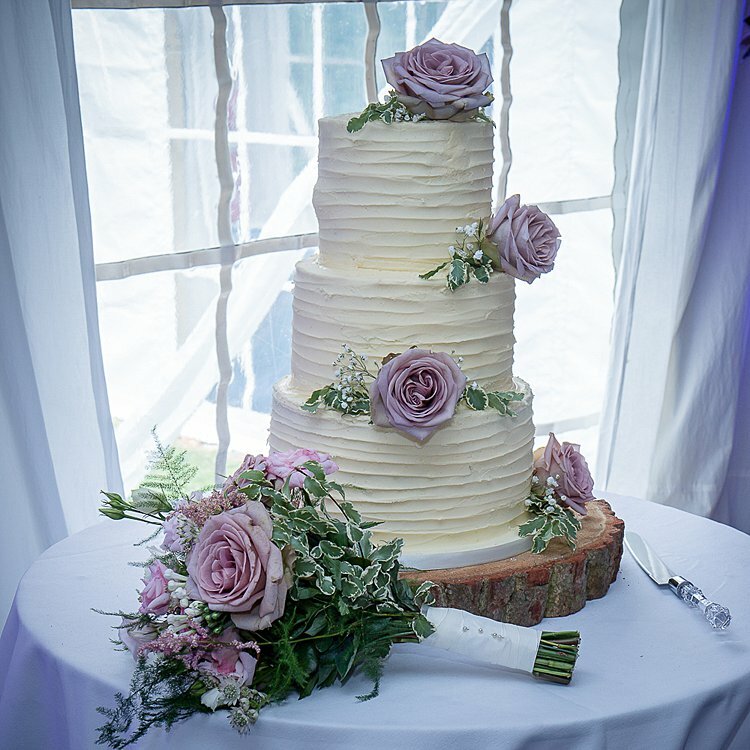 We chose it because we absolutely fell in love with the atmosphere, the service and most importantly the beautiful outdoor ballroom tent. 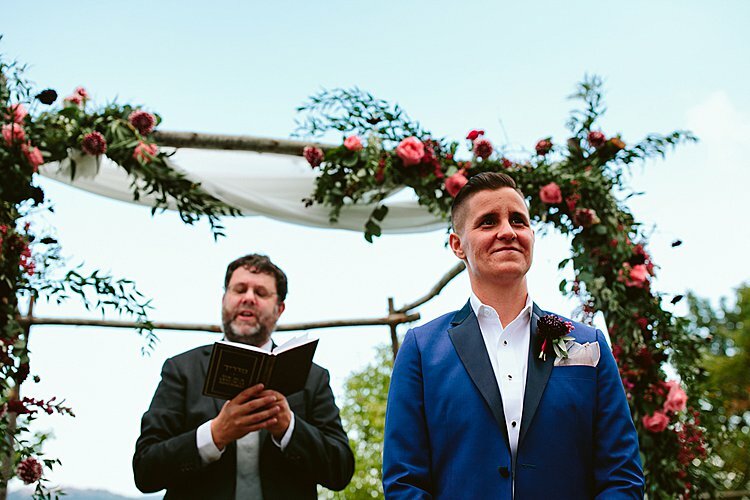 So you can only imagine out delight in finding out that she and groom Jerome booked their officiant, Smashing The Glass Recommended Vendor Rabbi Paul Glantz, via STG! Rabbi Paul helped the couple — Philippa is Christian, Jerome’s Jewish — craft an ultra-personal ceremony that reflected both of their backgrounds and traditions, complete with plentiful description of the Jewish parts of the ceremony so everyone could follow along, plus an explanatory order of service crafted by the bride. 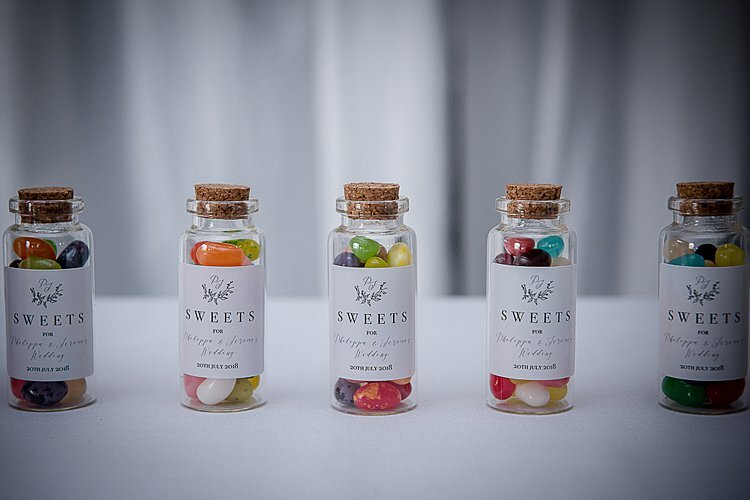 This is such a smart idea if you know you’ll be having guests who are unfamiliar with Jewish wedding traditions! 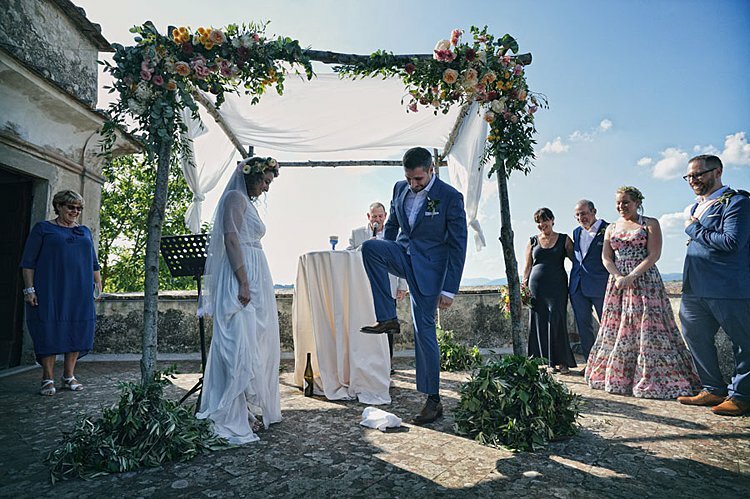 We also love that toward the end of the ceremony, after the rabbi recited the traditional Jewish seven blessings in Hebrew, the couple invited some friends and close family to give seven humanist blessings in English! And with Smashing The Glass Recommended Vendor the Function Band performing, this wedding was no slouch from an entertainment standpoint either. 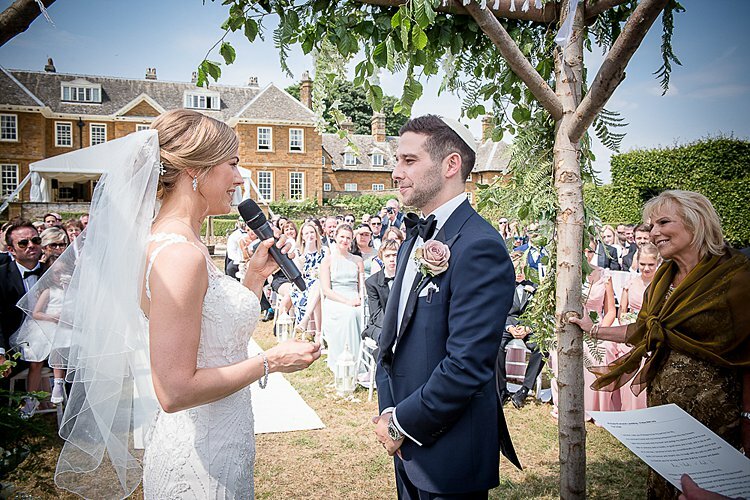 The Function Band are renowned far and wide for their ability to get the party started, and we’re not surprised that guest after guest came up to the couple to tell them how awesome the band was! 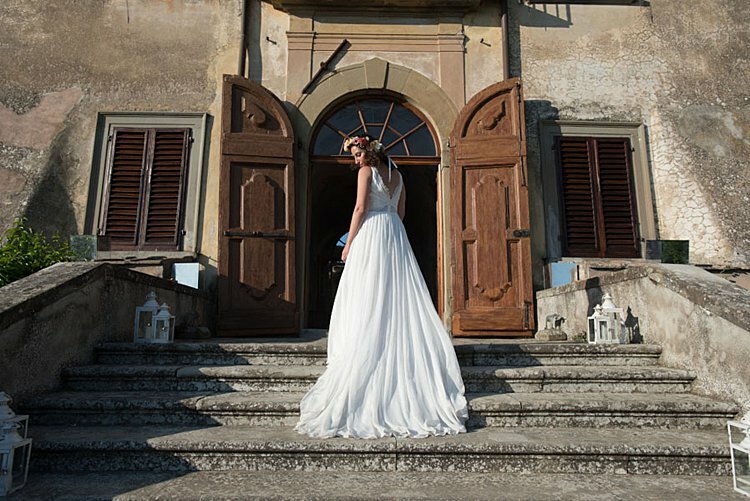 Philippa, the bride: Jerome and I both work in the media industry – I’m a producer at a creative agency making commercials and promotional content, and Jerome is head of strategic development at a creative studio, working in VR and CGI. We met through a mutual friend whom Jerome lived with at the time and we finally got together on a big group trip to Ibiza where we started kissing in the middle of a Hardwell gig at Ushuaia! We didn’t stop kissing after that. It didn’t take long for us to realise that it was meant to be and we moved into together after 3 months. We’re not sure what we’re more excited about in today’s Jew-ish wedding: the ultra-personal ceremony the couple crafted that blended their collective Italian, Israeli, and American backgrounds to perfection, or the jaw-dropping Tuscan scenery–and photographer Edoardo Agresti’s exquisite captures of the day, which somehow manage to be natural and artistic all at once. 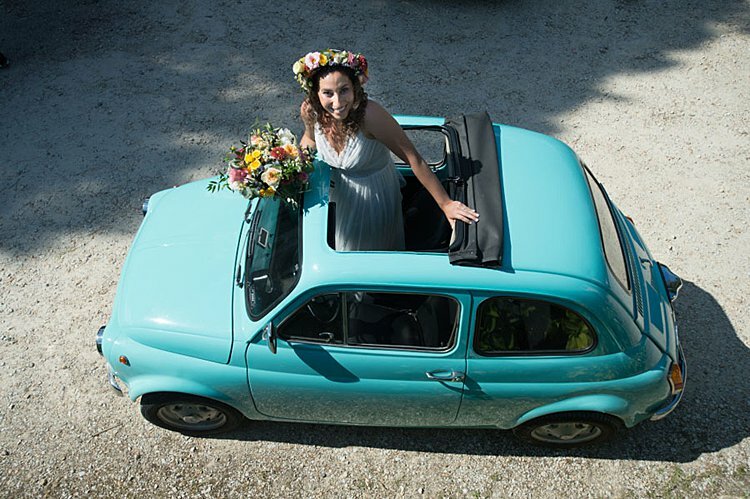 Oh… and we’re going nuts for the couples Fiat 500 wedding car too! Lital and Andrea, who run Padano Productions –providing sound, lighting, and AV for events (yes, that includes weddings!) 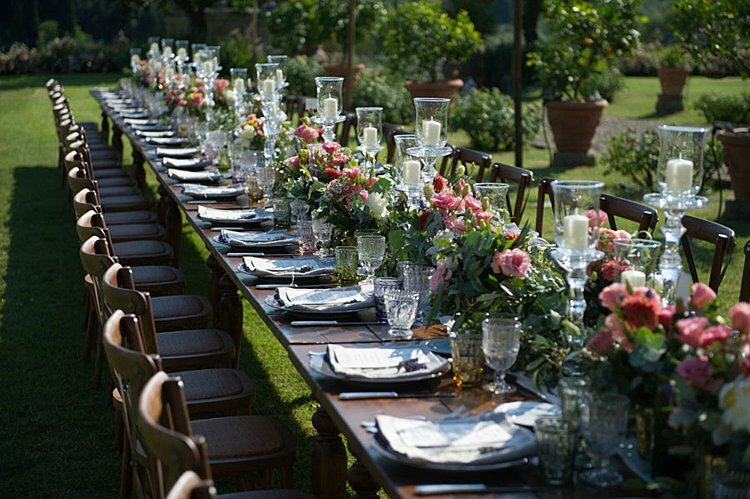 in the LA area–knew their top priority was crafting a wedding that was totally them. 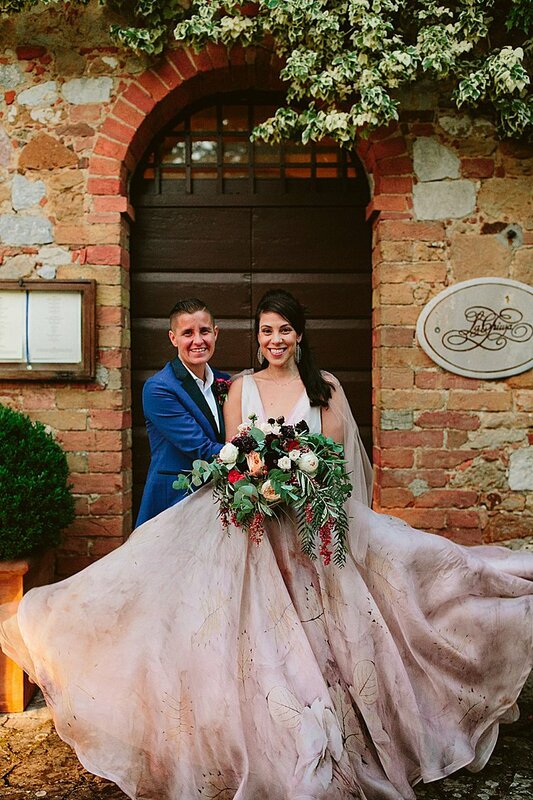 That meant combining Andrea’s Italian heritage and Lital’s Israeli-American background, and making sure the Jewish traditions they incorporated into the day were meaningful and fit with their personal beliefs. Our favorite example? They reworked the traditional seven blessings to put a unique, personal spin on the ancient text, and then had their closest friends and family read them aloud — 3 in Italian, 3 in Hebrew, and 1 in English. And then there’s the ketubah. 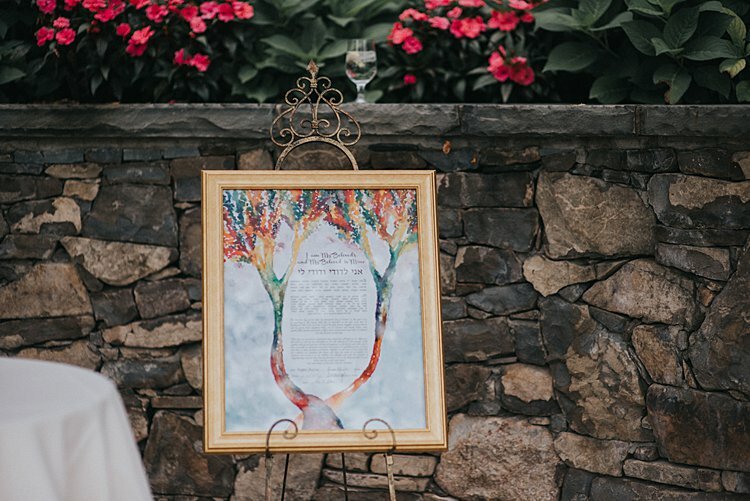 Lital and Andrea found the perfect combination — text that reflects who they are as a couple plus fabulous design — in mega-talented Smashing The Glass Recommended Vendor Stephanie Caplan from The Ketubah whom we ADORE! On a less spiritual note, we also love the fun favor these two opted to hand out to their guests: hats! But not just any old junky hat to shade them from that midsummer heat during the outdoor ceremony. These were super nice, sylish straw hats that, Lital reports, many of the guests are still wearing to this day! 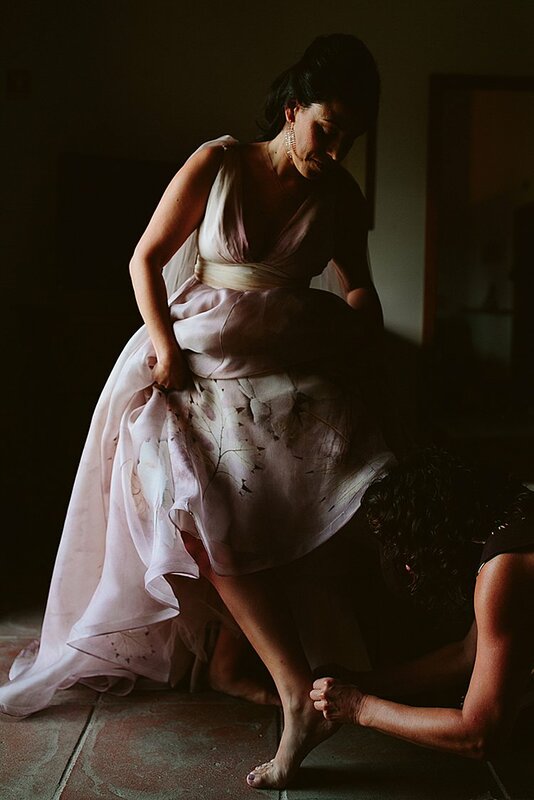 Now over to the bride, who looked totally gorgeous in her boho chic gown by Rita Vinieris — not to mention her epic flower crown! Lital, the bride: we met on J-Swipe (even though Andrea is not Jewish)! Amen to that, Risa! Our couples always have so much Jewish and Jew-ish wedding wisdom to pass on, but it’s not every day we get offered up advice that so perfectly describes our mission here at Smashing The Glass. 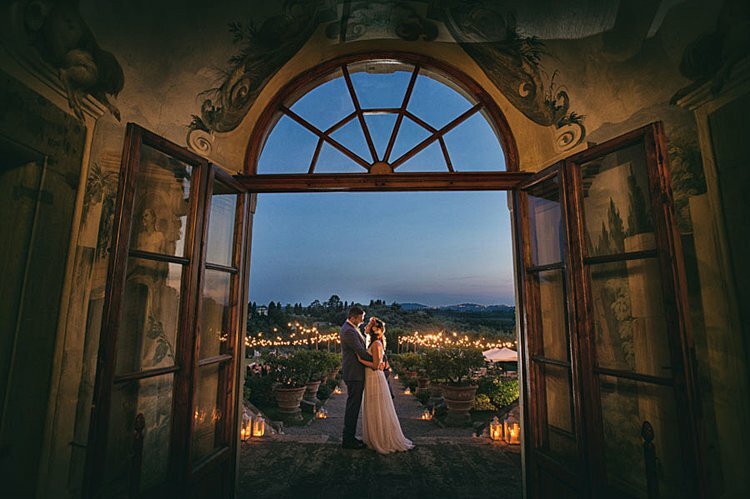 Between the totally swoon-worthy Tuscan setting (that also served to honor Risa’s late Italian father), a hora played by an authentic Cuban band, Michelin-starred catering using ingredients picked out of an on-site garden the morning of the wedding, a sweet floral chuppah, and a gelato card, we’re pretty much sold on this one. 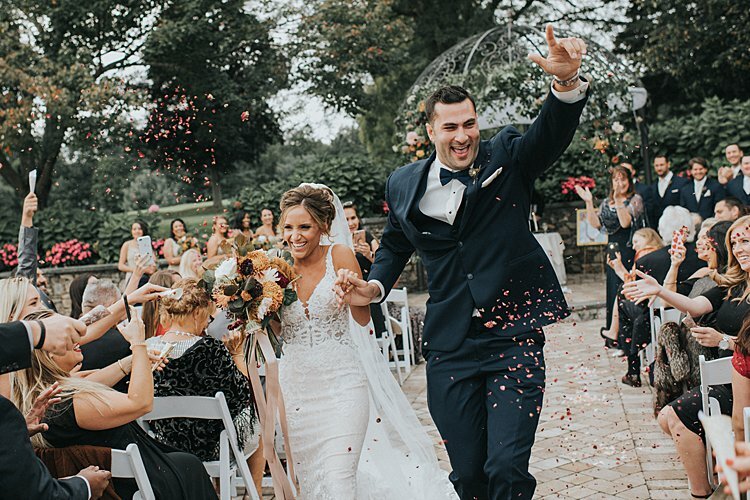 The brides did SUCH a fab job of combining Risa’s Jewish and Italian heritage with Anna’s Cuban background, plus their own sensibilities as a 21st-century couple, and we adore the fact that they decided to BOTH break a glass at the end of the ceremony. 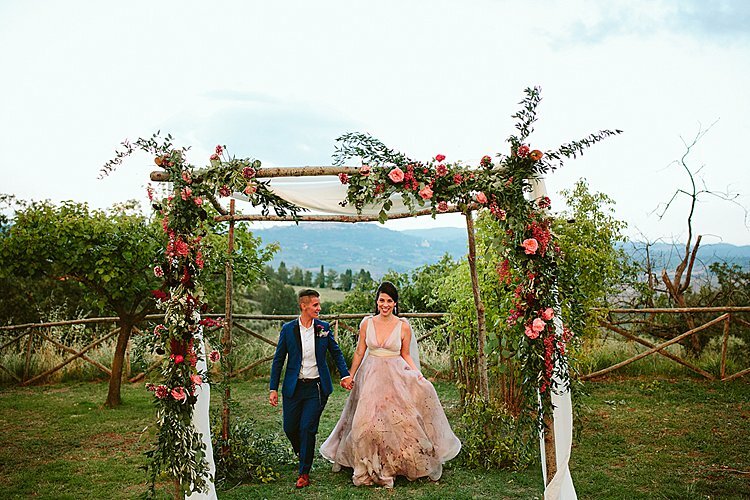 It doesn’t hurt that these two are a seriously stylish duo, either — Risa’s non-traditional blush floral gown from Rara Avis is truly a sight to behold, and Anna’s custom blue tux from Bindle & Keep was super dapper. Risa: We met through mutual friends and have been together for six years, with a two-year gap in the middle!